The Living Wellness team is excited to share a guest blog post from Arianne Lind and Peter Yovetich of SimplyyElevated. We chose the name SimplyyElevated because we want to help elevate peoples’ lives by simplifying what we tend to over complicate. This all starts with you (hence the double ‘Y’ in the name) and our last name is soon to be Yovetich. Also, on the note of ‘living’ we’d like to share a small snip of what it’s like to experience ‘a day in the food life/lifestyle of Arianne & Peter’ with you. Read more about our healthy adventure here. Are you ready to discover what our favorite recipe is?! I’m so excited to take you on this journey! Welcome to the incredibly adventurous world of AVOGUACO! Wait... Avo-what-o? You know, guac, like short for guacamole? Why not just call it guac or guacamole, you might be thinking? Well, our reasoning is simply because we’ve grown bored of the word guac/guacamole… it’s used all over the place! 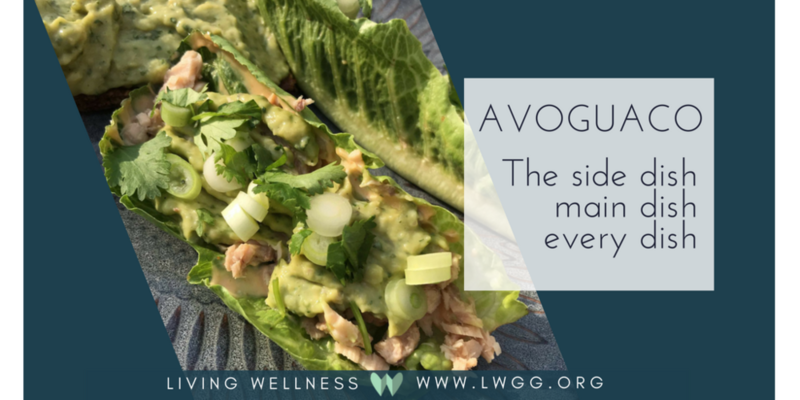 AvoGuaco is our unique twist of what most would call ‘guacamole’ and let me be the first to tell you… it can be used in MANY different variations! We also don’t use tomatoes in our recipe which is usually a staple item for guacamole. It’s hard to label it with a traditional name when we’ve used it in the various dishes that we have. Don’t worry... we’ll tell you all about those as well in our next blog post. But first, let’s get to the root of this. The foundation. The OG of AvoGuaco. Did I mention that we eat this almost every single day? Yep, it’s true. Totally wasn’t kidding when I said it was our favorite. I’d have to say that one of my favorite things about this recipe is how many different ways it can be used. It’s such a nice staple dish to have on hand that doesn’t take long to prepare. We make sure to have these ingredients on hand at all times. Every time we buy avocados the cashier always says, “WOW, what are you going to do with all of these avocados? !” Our response is the same every time… “Eat them!” since we each typically eat about one avocado per day. That amount might be too much for some, but this recipe is actually how I came to like avocados at all. I used to think guacamole and avocados were disgusting. I’ve found that the more and more I started to cook my own food, the more and more my taste buds and preferences changed. Everything that you’re about to see in our recipe is purchased organically. You can use ingredients that aren’t organic just as easily of course! Combine red onion and cilantro to a medium sized bowl. Roll your lemon on the counter to get it loosened up. Slice lemon in half and squeeze juice into bowl. Score each half of the avocado before removing the skin to make the mashing process easier. Either peel the skin off each half or scrape into your bowl. Using a fork, mash the avocado into the ingredients. Press mixture against side of the bowl to get AvoGuaco to the consistency of your liking while stirring together ingredients. Place onion cut in half, cilantro, lemon juice, salt & pepper to food processor or blender. Pulse a few times until onion and cilantro are chopped to your preferred texture. Add halved avocados to the food processor or blender and pulse to the consistency of your liking. AvoGuaco is best used when served fresh after mixing or within 24 hours. If you’re making this for yourself or want to make it in advance it can be stored in the fridge for up to 48 hours though some browning may occur. Browning will not affect the taste or health benefits, just the visual appeal. Peter and I would like to THANK YOU for tuning in today, and we hope you enjoy our recipe! If you have any questions around this recipe or food in general please email us at simplyyelevated@gmail.com and if you’d like to find out more about us, we are on Facebook and Instagram (IG). Peter Yovetich is peter.elevated on IG and I am simplyyarianne on IG. We would LOVE to hear from you! Also, huge thanks to the Living Wellness team for being such an inspiration to us and for being an incredibly uplifting group of people! We are forever thankful that we have been blessed with your program, books, videos, faith, leadership, and friendship! Stay tuned for my blog post next week where I share the health benefits of avocados and fun ways to use the AvoGuaco recipe!